This AMAZING Anti-hair ESSENCE combines the BEST of herbal AND oriental medicines, integrated with the MOST ADVANCED hair care technology. 30 Day FREE trial! 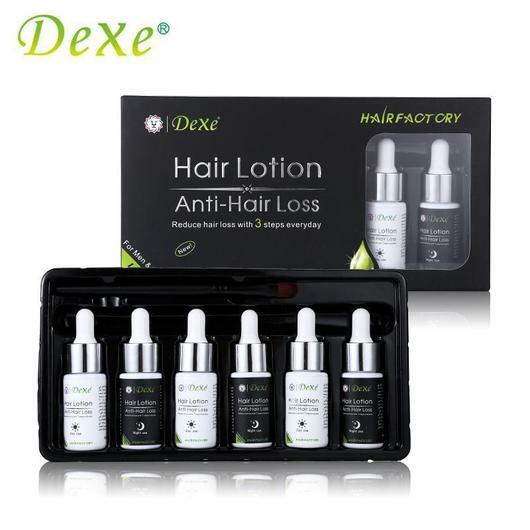 The DeXe HAIR TREATMENT ESSENCE Contains essential bio-active nutrients improving the hair while creating a healthy environment for hair growth. REDUCE HAIR LOSS IN 3 EASY STEPS! Our 3-step Hair Treatment Essence is created focusing on hair loss and hair thinning problems. Contains essential bio-active nutrients improving the hair while creating a healthy environment for hair growth that works perfectly paired with Anti-Hairloss Shampoo. Take the Hair Nurturing Liquid and apply a few drops to desired hair area. At least,1-2 times a day. Gently massage until the scalps absorb the oil. Don’t use on wet hair/scalp. Note: Use the White Bottle ( Day Use ) Hair Nurturing Liquid in the morning and use the Black Bottle ( Night Use) Hair Nurturing Liquid in the evening. For visible results use at least 2-3 months. Due to high demand, these are selling out fast! 30 Day FREE trial! If for any reason you’re not satisfied with the product, return the product for a full refund minus the shipping cost. Due to extremely high demand, orders take up to 10-20 business days to ship and arrive. Please be patient, we are doing our very best to fulfill every order that we receive!